Describing a camera as being designed and made by hand in Germany still comes with a certain cachet – and one, in the case of Leica, that many photographers feel is worth paying a premium for. Acting as both a beacon for gear nuts and a badge of pride is that familiar Leica red dot logo on the front of most of its models. Simply put though, owning a Leica is a goal for most photographers who are serious about their art. To use a well-worn car analogy, Leica is the Ferrari of the digital camera world. And they nearly all come at a price to match... so if you are looking for value for money head to our guide to the best cameras around. It’s not all about luxury though. There are plenty of pro-spec Leica cameras commanding an eye watering price tag, but if you don’t want to blow over a month’s wages on a camera, there are more affordable and covetable Leica models to be found. Look out for the Sofort instant cameras, for instance, which utilise Fujifilm Instax Mini film packs. And there are a range of compacts too, modelled on designs developed with Panasonic. So, with the above in mind let’s look at 10 of the best Leica cameras currently on the market and available to buy. Successor to the four-year-old ‘Q’, the Leica Q2 is aimed at photographers wanting a powerful camera that is also relatively small and discrete. Key features include a fixed focal length 28mm f/1.7 maximum aperture lens that’s a match for the original ‘Q’, yet a whopping 47.3-megapixel full frame sensor this time around. Added to this, the camera body is now water and dust resistant plus there’s a 4K video shooting option that additionally includes the choice of ‘C4K’ (Cinematic 4K). In terms of burst/continuous shooting, the camera offers up to 10fps if the mechanical shutter is utilised. Otherwise it’s 20fps with the aid of the electronic shutter. While not the swiftest on the market, the Q2’s 0.15-second auto focus performance is comfortably described as swift. The Q2 is now Bluetooth enabled and is, of course hand constructed in Germany, with a magnesium body construction. Leica’s downloadable Fotos app, when used in conjunction with the Q2, can ‘wake up’ the camera, as well as acting as a remote plus means of transferring and sharing shots. Yes, this is very much a luxury option for the street photographer, but the 47-megapixel sensor delivers shed-loads of gorgeous detail. You’ll want to queue too for Leica’s Q2, with a waiting list likely. A ‘stealth’ version of the previously released M10, this version comes without the giveaway red Leica dot on the front plate, but is otherwise nigh identical save for a few additional tweaks. These include the Leica M10-P becoming the first Leica rangefinder to feature a touch screen LCD plus an electronic spirit level, while its shutter release mechanism is also the quietest in its class. Added to this, the series’ plastic hotshoe cover has been replaced with an all-metal one. Emitting that heady mix of old school charm and signature Leica luxury, the camera makes you focus by lining up a ghost image with the fixed field of view optical viewfinder, while despite the inclusion of a full frame sensor here, resolution remains at a fairly conservative 24 megapixels. We also don’t get any video capture option, in an attempt by its maker to distil the camera down to the pure essentials of photography. That said, the backplate LCD allows for use of Live View and focus peaking – so this camera feels like a best of both worlds in many respects, marrying digital know-how to classic analogue operation. A premium compact for both snapshots and street photography, the D-Lux 7 is a fixed lens, travel zoom camera that nevertheless exudes that air of luxury (the clue is in that D-Lux = Deluxe naming) we’d expect of a camera costing almost a grand. Key features include a play-it-safe 17-megapixel resolution from a 21.77 megapixel Four Thirds CMOS sensor. This is married to a lens with an equivalent reach of a wideangle 24-75mm in 35mm film terms. Maximum lens aperture is an impressively fast/bright f/1.7, with the ability to adjust this manually via a lens ring that offers incremental settings up to f/16. Or, of course, you can just hit the automatic setting, which has its own button. Given Leica and Panasonic’s long standing collaboration, it’s unsurprising that this model arrived so soon after – and so closely resembles – the cheaper Panasonic LX100 IIh. Thus we get the Panasonic-like shooting options that include both 4K stills and 4K video options. It’s a shame perhaps that the 3-inch LCD is resolutely fixed, but it does at least offer touch control. We also liked the fact that the rangefinder-like top plate dials for controlling shutter speed and exposure compensation lend the D-Lux 7 a classic handling experience, the camera bringing matters up to date by including Wi-Fi, Bluetooth and USB connectivity. More known for releasing cameras to the luxury markets these days, here’s an opportunity to own a Leica at an affordable price – and one of the best instant cameras currently available. Similar to Fujifilm’s less-expensive Instax Mini 90 – the Leica Sofort is available in several color options. It can use Fuji’s Instax film packs, which work out at around £1/$1.50 per printed image. Leica's own branded film packs are dearer. These instant packs provide credit card sized images, smaller than the Polaroid instant prints you may recall from childhood. Undoubtedly though, there is still a thrill in witnessing an image ‘emerge’ slowly before the eyes once the camera has squeezed out a print. You can also buy monochrome film packs, to indulge in extra arty low fi whimsy. 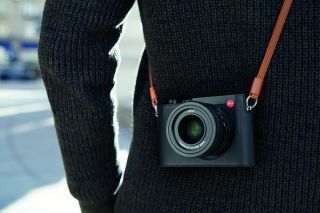 The camera comes with a Leica branded shoulder strap, which proves useful because at 122x94x58mm the camera is too bulky for a jacket pocket, though its manageable weight of 310g means it’s fairly easily transported nonetheless. A smaller front mirror aids the taking of the inevitable selfie while operation is kept simple via the fact that the only control on the camera’s top plate is a shutter release button. With focusing as close as 0.6 metres, a 60mm lens on the Sofort’s front provides the equivalent of 34mm, means that what we get in terms of film images is similar to what the human eye sees. ‘Sofort’ is German for instant, in case you were wondering. Arriving in Light Gold or Midnight Blue, here’s another Leica compact that apes an existing Panasonic model – in the case of the Leica C-Lux it’s the Panasonic TZ200. And, yes, this ‘compact luxury’ option is again dearer than its doppelganger. Still, for a Leica camera of any description, it’s actually relatively reasonably priced. For that we get a retracting 15x optical zoom providing a focal range the equivalent of 24mm to 360mm, plus 4K video shooting at up to 30fps from which 8 megapixel stills can be grabbed. There’s a touch sensitive 3-inch LCD on the backplate, but it’s resolutely fixed, plus a tiny eye-level viewfinder. What will be enticing imaging enthusiasts here, however, is the camera’s larger than average for its class one-inch sensor, which boasts a respectable resolution of 20 megapixels. Another plus is that the camera’s auto focus is quick to lock onto target, thanks to 49 AF points. Users further get the opportunity to bias focus to a particular area in the frame, via simply tapping the rear touch screen, whereupon the selectable points are displayed. As expected at this price point, there is the ability here to shoot Raw files as well as JPEGs, or the two in unison. OK, so you might be able to afford a mirrorless compact or even DSLR for a similar outlay. But considering this is a Leica with a one-inch sensor, the manufacturer offers more bang for your buck than usual here. This German-constructed, attractive compact system camera welds a large for its class 24.2 megapixel APS-C sensor to a Leica L lens mount, as recently adopted by Panasonic for its fledgling full frame ‘S’ system. It’s a sister model to the TL2 camera launched around the same time, which also features a similar feature set. On the CL, meanwhile, chief points of interest include a touch sensitive 3-inch LCD, photo enthusiast enticing eye level viewfinder, 4K video along with built-in Wi-Fi connectivity and up to 10fps burst shooting for up to 140 JPEGs, or 33 Raw and JPEG files in tandem. As it shares the L mount with the TL2, it can utilise the TL line of Leica optics, while Leica M and R series lenses can be used with adapters, and SL lenses without the need for one. Top plate dials give the camera the classic hands-on operation beloved of Leica users, while external flash can be attached if so desired via its vacant hotshoe. While there’s plenty to love here, the rear screen cannot be tilted or adjusted while there is the usual Leica premium to pay for a hand crafted camera rather than a mass produced one. With its slim, minimal and sleek exterior this Leica certainly makes a fashion statement, while the huge for its class 3.7-inch screen that occupies all of its backplate should appeal to existing smartphone users looking to trade up to a dedicated image capture device. If we’ve a gripe it’s that attaching a lens makes the camera feel a tad front heavy, while the minimalistic design has led to some operational quirks – not least the fact that its controls take a bit of initial figuring out. There’s also no on-board image stabilisation and the auto focus response isn’t particularly fast. Still, it is intended to be a serious photographic tool too, thanks to its adoption of the L mount, 49-point contrast detection AF system – as also found in Leica’s more ‘conventional’ CL – plus, unusually for a digital camera these days, 32GB of built-in memory. Added to this we get the option of 4K video and it can shoot stills up to a respectable 20fps with the aid of its electronic shutter. Another plus is that the image quality is stunning, even if its slightly uneven body/lens combination, quirky controls and could-be-faster responses ultimately still leave something to be desired. here are not many Leica cameras you’d feel confident about stepping into the deep blue and briny with – so full marks to this waterproof version of the same manufacturer’s X-E compact camera that doesn’t slouch when it comes to core specs. The X-U has an APS-C format chip and a wide angle 23mm equivalent bright/fast f/1.7 Summilux prime lens for delivering those shallow (water) depth of field images. The price is a lot to pay for a toughened camera, yet this compact is also shock resistant, dust sealed and shatterproof. For those thinking of taking it for a dip, the body is fully waterproofed down to a depth of 15 metres and also features an underwater protection filter. Further worthy of note here for those as equally interested in image quality as ruggedness, is a larger APS-C format sensor capable of capturing 16 megapixel images. This combo should deliver better quality than either the one-inch sensor or 1/2.3-inch chip found in rival waterproof cameras, even if they are nearly a tenth of this Leica’s asking price. This high-end adventure camera can also capture Full HD video too – perfect for capturing those shoals of fish in-camera. In short this is a waterproof camera at an eye-watering price – but one that very much stands out from the crowd. Landing any time now – having originally been announced back at Photokina 2018 – is this update of Leica’s medium format system camera in the S3 (the S2 was originally announced at Photokina 2008), which now boasts a hefty 63 megapixel resolution (a 1.7x increase from its predecessor). This is an evolution of an existing camera rather than a revolution truth be told, and intentionally so, with 4K Cinema resolution video also being offered this time around. The S3 does however possess that Leica magic, despite many controls being unlabelled, the lack of a stabilised sensor and omission of an electronic viewfinder. Phase One’s alternative may have many more megapixels and Fuji’s rival may give us an electronic viewfinder and in-body anti shake, but they don’t have the covetable red dot on the faceplate. Leica’s latest incarnation of its ProFormat sensor is capable of shooting at 3fps and light sensitivity now tops out at ISO 50,000. Like its predecessor, the camera delivers Leica DNG (Raw) files and in terms of video provides un-cropped Full HD and 4K video, while this time around its manufacturer has opted for rounder, fuller DSLR style ergonomics that should feel familiar to most, at lest at the outset. The optical viewfinder is similarly generously proportioned. Yes, this isn’t an everyday camera for everyday people, but even if it may be slightly impenetrable at times, it is inspiring. Here’s a curio: a digital camera that shoots only in black and white: inspired madness… or just plain madness? It’s of a certain niche and an expensive one at that, for sure, but the quality of results justifies Leica’s brave decision to use a monochrome sensor. At its core is a 24 million pixel CMOS chip, coupled with the option of live view display and 24fps Full HD video capture. Light sensitivity range tops out here at ISO25,000, with ISO320 the lowest setting, while shutter speeds run from 60 seconds to 1/4000 sec. Focus is, this being a Leica M for enthusiasts, an entirely manual affair. The camera is pretty hefty and solid feeling, with construction involving brass, leather and magnesium alloy. Its bright viewfinder provides a double image rangefinder view, with guidelines for the lens in use, so users can compose and focus at the same time. Shooting in Raw and JPEG simultaneously can create some delays, but the uncompressed DNG (Raw) files can conveniently be opened in just about any image editing program or viewing software. In summation, yes, almost every digital camera has a black and white mode and you can convert images to monochrome in any image editing software, but none will have quite the same look and feel as an image from the wonderfully eccentric Leica M Monochrom.